Book Review – ‘Extreme Adventures at the Highest Temperatures on Earth’ by Ranulph Feinnes. I read this whilst on holiday recently in the Canary Islands where it was fairly hot for the time of year. To be fair I have been to some incredibly hot countries and experienced extreme temperatures so I can feel some of what Ranulph Feinnes writes about. I will admit he is one of my heroes and I have read a lot of his books so I am a little biased. I really enjoyed reading it, its a tremendous collection of stories, some are recreated from previous books and articles. I do not see this as a downside as this time Ranulph goes into much more detail and the Kindle version, which you can read on a laptop too, was free. The main focus of the book is his time attached to the Sultanate of Oman fighting Marxist rebels. I have read a little of this before but this time with much greater depth into the social and political conditions and how cultures, language and diet are affected by heat. This is true when he describes how he and his companions recreated the journey up the River Nile, another epic expedition fraught with a huge variety of dangers all associated with the heat. 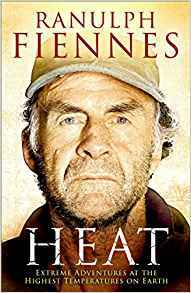 If you want examples of resilience and determination, Sir Ranulph Feinnes has this by the bucketful, it was a compelling read and excellent for a holiday read on the sunbed soaking up the sun. Working and training in heat presents tremendous problems and I learned some interesting ways of minimizing the affects that I did not know before, Like anything else they are obvious when you read them, learning from the environment we are in and what lives there, flora and fauna, is more the territory of my colleague Toby Cowern but there are a couple of gems in this book. The writing style is at times a bit swashbuckling but I understand why that is having read a lot of his books, there is humour here too as some of the worst encounters with disease, giant insects, snakes, crocodiles and the rest also often have a funny side.